Smoothie Pops: because who doesn't love 2 for 1?! It has been hot, hot, hot in NYC making it officially smoothie season. I'm a big fan of my morning smoothie and I am always trying new combinations. Smoothies are a great, quick breakfast, packed with nutrients and protein. Sometimes I make more than I can drink and have found the perfect way to make good use of the extras- Smoothie Pops! Super easy, healthy and refreshing these popsicles are a wonderful all natural, cooling treat. Below are two of my go-to recipes. Give one or both a try but feel free to try your own combinations and get creative! Combine ingredients of the smoothie of your choice. Blend until smooth. Fill a glass with your smoothie. 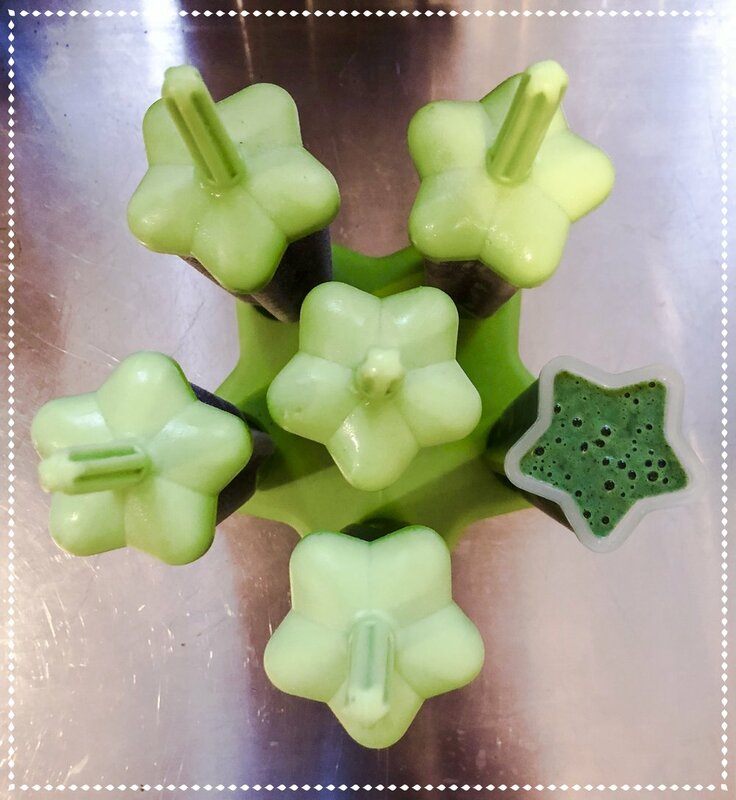 Pour the remainder into popsicle molds and freeze. Freeze for 2-3 hours. Bon appetit and stay cool, yogis! My yogi toolkit is a collection of short practices I count on to bring balance and calm to my day. These practices are a great way to supplement a yoga practice when I have a few minutes to spare. One simple practice I carry in my yogi toolkit is 2-1 breathing, or Rechaka Pranayama. This simple breathing exercise doubles the length of the exhale, bringing stress relief to body and mind. It is the perfect antidote for anxiety, insomnia and stress. Unlike other pranayama techniques, this practice can be done anytime, anywhere, without the supervision of an instructor. Begin by taking a tall seat, with the legs crossed. Ideally the hips are higher than the knees. Feel free to sit on a blanket or yoga block if this makes this alignment possible and/or feels better for your back. Close the eyes and begin to breathe evenly in and out through the nose. Once you feel you have established a consistent rhythm, breathe in for the count of 2 and breathe out for the count of 4. Take a few rounds of this breath ratio. As you are ready, increase the breath ratio by inhaling for the count of 3 and exhale for the count of 6, then progressing to a ratio of 4 to 8, and so on. Take care not to push past your breath capacity. This exercise should feel calming and should not create strain. Take this 2-1 breath for a few minutes, or until you feel the mind settle. Once you feel ready, take a few even breaths, bringing the breath back into a steady, equal rhythm. Open your eyes and continue your day, with a bit more calm and clarity. Just a few minutes of Rechaka Pranayama has the ability to quiet the mind. Try it out the next time you need to recenter, such as the next time your train is stalled! Give it a try for instant calm.